Grand Technologies, based in Grand Rapids, Michigan, is a distributor of machine automation control components. The company provides sub-assemblies, such as heaters with temperature controls, to process equipment manufacturers and also offers programmable controllers to makers of automated systems. Grand’s customers range from small to large companies in a variety of industries. While Grand Technologies has a roster of approximately 400 customers throughout the state of Michigan, President Dan Schroeder describes the market as “highly technical industry and extremely competitive.” According to Schroeder, the key market differentiators often are whom the customer trusts and the level of service offered. He emphasizes that Grand focuses on service as its major competitive edge. While many of Grand’s competitors offer some form of service, Grand offers a deeper level of service. In fact, the company maintains a dedicated in-house application engineer to provide customers with post-purchase support, answer operational/technical questions and assist in the programming that some Grand products require. Grand Technologies had been using a rudimentary ERP software solution for which upgrades and support were no longer available. The company tried several ERP solutions targeted at the smaller manufacturer but found them weak on inventory tracking. With more than 500 different inventory items, Grand required a solution with strong inventory management capabilities. A software distributor recommended that Schroeder investigate SYSPRO enterprise software. 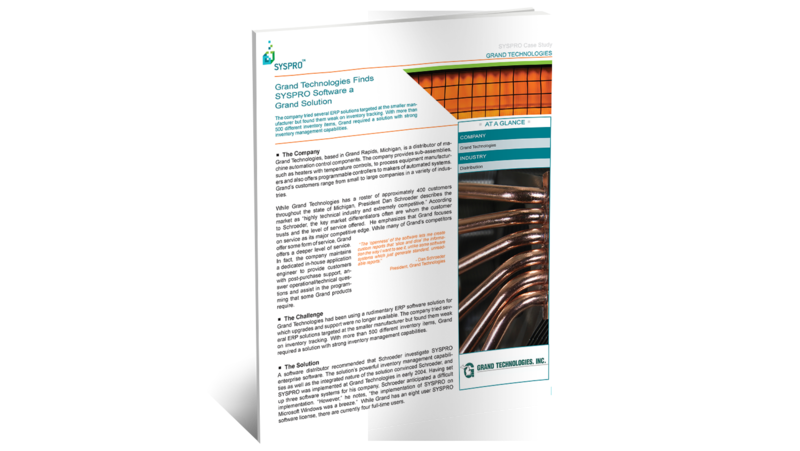 The solution’s powerful inventory management capabilities as well as the integrated nature of the solution convinced Schroeder, and SYSPRO was implemented at Grand Technologies in early 2004. Having set up three software systems for his company, Schroeder anticipated a difficult implementation. “However,” he notes, “the implementation of SYSPRO on Microsoft Windows was a breeze.” While Grand has an eight user SYSPRO software license, there are currently four full-time users.